Ricky Manetta appears out of nowhere, during a story about being down and out in London, in front of McSorley’s Ale House on the bottom floor of the Venetian in Macao. He’s wearing a brown leather jacket and close cropped blonde stubble; he has the sharp featured English face and barely contained energy you see in Guy Ritchie movies, or looking back at you as you enter the wrong pub wearing the wrong colors. He listens intently as the story moves to the big park in St. John’s Wood, and reaches a climax at the gates of the golden mosque down the street. As the tale peters out, everyone looks to Ricky because it’s obvious he wants to speak. I’m expecting some Vinny Jones style real talk, not the heartfelt sentiment that follows. He then tells a story about stealing a car in Hackney, getting chased by London’s finest, and then slamming into a brick wall and flying through the windshield. In just a few more minutes, he tells me about being fostered out to a family as a child, bullied as a teenager, and about his current project, something called MMA Krav Maga. When he tells his story, he alternates between laid back serene confidence, and feverish leaning in, almost pleas to feel what he feels. I’m beginning to see the engine in Ricky’s belly, the old memories and new skills that make him twitch as he sits, turning his thick East London accent into rapid fire proclamations; one third thug, two thirds dreamer. UFC Fight Night Macao is just a couple days away, and Ricky’s day job is coordinating logistics and security for international UFC events, “the English Burt Watson,” he says, and so he’s gotta be off. Meet me in Tokyo for the Mark Hunt fight, he says as he leaves, I’ll be there. Ricky is a busy man. His team handles security and logistics for most European UFC shows (including the most recent one in Stockholm) and his responsibilities grow with each event, now including self-defense classes for ring girls. 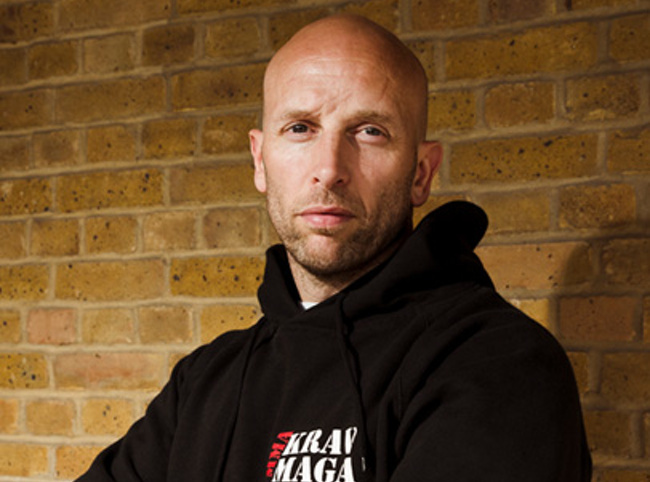 He runs five clubs in London, teaching his brand of Krav Maga, and he has been hired out since 2010 to teach London cabbies how to defend themselves. 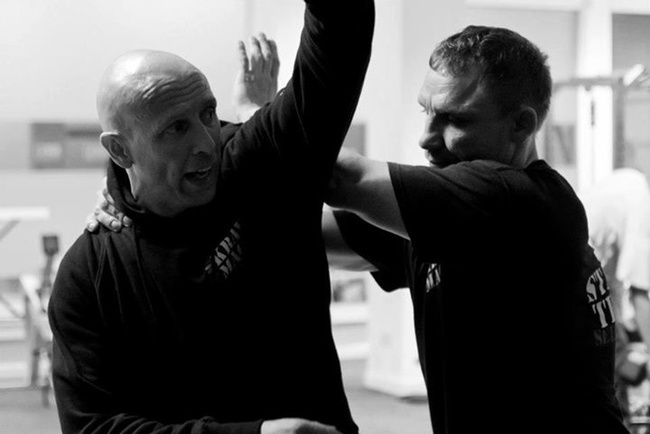 The Krav, as he calls it, is his passion. It’s how Ricky hopes to leave a mark on the world. Krav Maga is the hand-to-hand combat system used by the Israeli Defense Force, based upon a mixed martial art developed by Imi Lichtenfeld to defend Jews in Bratislava from fascist thugs. Since the late 1970s, Krav Maga has been adopted by police forces and military organizations around the world, due to its effectiveness when dealing with ornery protestors, rebels, or other undesirables. The Establishment is fond of the system. This fact combined with the liberal teaching of eye gouges and throat strikes in commercial Krav Maga schools has given rise to the idea that Krav Maga has forgotten its roots, and turned into a tool for those Imi Lichtenfeld once fought. I learn about MMA Krav Maga, Ricky’s version of the Israeli art, in the lobby of the Tokyo Hilton, a few days before Hunt KO’s Nelson in the Saitama Superarena. Ricky has trained with the likes of Bas Rutten, who seems positively jolly when he talks about breaking faces, and Itay Gil an IDF officer and special forces commando who is also one of the foremost Krav Maga instructors in the world. One could be forgiven for assuming that Ricky and his team would be just as happy to use a bit of excessive force when subduing rowdy UFC fans post-fight. But Ricky was never the bully, never the guy willing to do three special forces missions a day and “terminate threats” in the name of the state. He also isn’t the victim turned martial artist turned enforcer that the police in the US are often accused of being. The force that drives him is the same one that may have driven Imi Lichtenfeld to stand up to oppressive power back in the 1930s: a contradiction at the core of who he is, a tough guy who is now a victim; a victim with a hero lurking inside, waiting to jump out. The difference between Ricky’s presence and the presence of a representative of the State is motivations and dreams. A soldier or police officer trained in Krav Maga is motivated to keep the peace, whatever that may take, including subduing anyone saying anything regardless of reason or just cause. After the fights Ricky and his entire crew go out on the piss in Tokyo. Here is a moment of truth, when the words and speeches Ricky and his boys have been giving me will be put to a test. Drink makes a violent man sneer and start fights with strangers; it also makes the good man smile wide and buy drinks when he’s out with his friends. Ricky turns out to be the big brother, keeping everyone together, dancing the hardest, telling bad jokes, making the dorks in the crew feel at home. In vino veritas. So Ricky and his boys passed the liquor test. Does that mean teaching eye pokes and groin strikes learned from Israeli commandos is going to help rebuild the spirits of people victimized by bullies? When Ricky peppers his speeches about building up people spiritually with descriptions of pulling out an eye, or killing someone threatening his daughter, he’s channeling the ancient contradiction that through the green drives the flower, and it can be used for ill or for good. Krav Maga: Martial Art of the New World Order?